A very spacious, cool and secure Apartment on the First Floor of a small Block of only 4 Units. The Apartment is well equipped with a modern Italian Kitchen, and two recently refurbished Bathrooms. Both Bedrooms are air-conditioned and all rooms have ceiling fans. The Apartment is secured with wrought Iron, so doors and windows can be left permanently open even when you go out. There is a large Lounge/Dining Room which opens fully onto a Double Balcony with soft seating and Gas Barbeque, overlooking the Garden and Swimming Pool. The Master Bedroom has an en-suite Bathroom - there is a second Bathroom in the Hallway. Two Electronic Safes. The Kitchen is equipped with Fridge/Freezer/Ice Maker, Microwave, Oven, Hob, Dishwasher and small Appliances. Smart TV with Satellite 'Direct TV' Service, DVD, HDMI, CD and iPod Player. Private Car Park. Gardener and Full-Time Housekeeper. Laundry Facilities with Dryer are in a separate Building. Mullins Beach is a 4 minute walk down the road. Shopping Facilities in nearby Speightstown or Holetown. Picture Show and Full Description: A PDF with additional photographs of the Apartment, Pool and Garden and of the surrounding area is available and we will send that to you when we receive your enquiry. Facilities in the Apartment: Remote control air-conditioning in both bedrooms as well as vari-speed ceiling fans. Two separate Electronic Safes. WiFi in the Apartment and around the Pool, DECT Telephone with cordless handsets in Kitchen and both Bedrooms. They also work around the pool. Local telephone calls are free. The Apartment is secure - Balconies and Windows as well as the Front door are fitted with (reasonably attractive) wrought iron grilles to allow open windows and doors even when you are not there. Fins, Masks and Snorkels, Boogie Boards, Ice Box and Cool Bags, Foldable Beach Chairs and Mats, Yoga Mat. Location: Mullins is on the beautiful West Coast in St Peter north of Holetown and just south of Speightstown. Mullins Beach is one of the nicest small Beaches on the West Coast and has a famous Beach Bar and Restaurant. It connects to Gibbs Beach, which is secluded and quieter than the other Beaches. Restaurants, Supermarkets and Shopping can be found in nearby Speightstown or along the Coast Road and in Holetown. The Barbados Golf Club - 18 holes par 72 -- Royal Westmoreland - 18 holes par 72 and Apes Hill will also soon open to the public. Modern en suite Bathroom with Toilet, large Shower and counter and Hand Basin. Large Mirror and Magnifying Mirror. Hair Dryer. Laundry Basket and Pedal Bin. Bathroom Cabinets Bath Towels, Hand Towels and Beach Towels. Electronic Safe, Second Bathroom (accessible from Hallway) with Toilet, large Shower and counter and Hand Basin. Large Mirror, Magnifying Mirror, Hair Dryer. Laundry Basket and Pedal Bin. Bathroom Cabinets Bath Towels, Hand Towels and Beach Towels. Second Electronic Safe. 'Direct TV' Service (Satellite) is not brilliant but ok for News and some Films. Large Rooms: Lounge 5.7 x 4 m (18'4' x 13') Master Bedroom 7.3 x 4 m (23'4' x 13') Second Bedroom 4.6 x 4 m (15' x 13') Ask for Floor Plan. Housekeeper Service included, Beds changed / Laundry twice a week or on demand. Full time Gardener also looks after Pool and Maintenance Twin Beds in second Bedroom can be joined to create one King-Size bed. Children should be at least 5 years old and must be able to swim as the Swimming Pool is not supervised and does not have a shallow end. Wireless Broadband (free) The Swimming Pool and Garden are shared by the 4 apartments. It is my own Apartment! Why does your software not know that? We recently stayed at Casablanca 3 for three weeks. The condo is wonderful and so well appointed, everything we could possibly need was there. We had one minor glitch upon arrival, however, it was taken care of so quickly and efficiently, that it became a complete non issue. The decor of the apartment is really lovely, and really makes you feel welcome. All the staff we encountered were wonderful, and very helpful. Harald was fantastic to deal with, right from the start. The information he sends, and that is available in the place, goes above and beyond. I cannot say enough in this regard. He even phoned us to make sure all was well. We have stayed in many different places in Barbados over the years, and this one was truly a find. We will be back, we just need it to be longer next time! We cannot thank Harald enough for sharing his place. Thank you for that review - I am sorry about the little wait on your arrival but I am glad that you enjoyed your stay in our Apartment. I will pass this on to the staff, who will be very pleased to hear that their efforts are appreciated! This apartment is incredible! The pictures truly reflect the beauty, cleanliness and modern finishes of this apartment. This was our first Home Away experience and of course we were quite apprehensive. However, Harald was very easy to communicate with and provides detailed information about the property and Barbados right from the get go. This apartment is immaculately clean and anything you can imagine that you may need during your stay is provided. I love all of the Art and photography showcasing Barbados' rich culture that is displayed throughout the apartment. The pool and tropical garden scenery is exceptional. Loved seeing the monkeys jumping through the trees each day! It's an easy 5 minute walk to Mullins beach which is spectacular. There are great restaurants near Mullins and Speightstown. This neighbourhood is quiet and perfect for families or for those looking for a restful vacation. It's super easy to reach different parts of the island by bus or taxi. My family and I feel truly lucky to have had the opportunity to stay at Harald's apartment. I would not hesitate for a moment about staying here again. I hope to be back soon. Thank-you Harald! Wow - what a nice review! I am so glad that you all enjoyed your holiday and your stay at our Apartment. 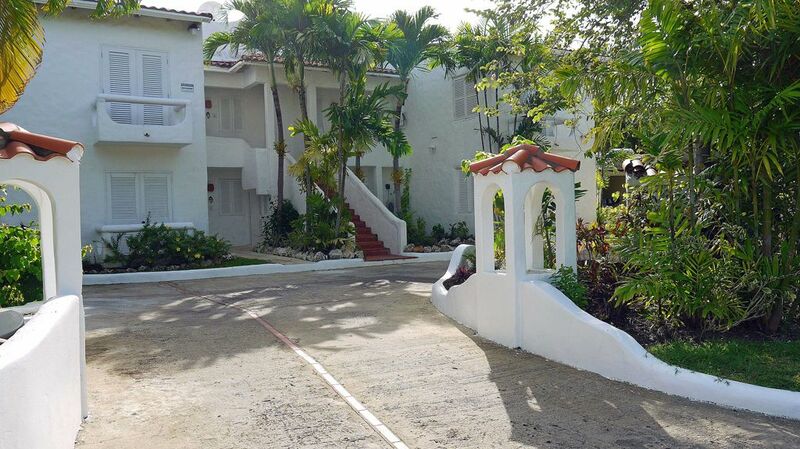 A well equipped, clean, spacious apartment in a lovely quiet cul de sac just a short walk from the beautiful golden beaches of Mullins bay, I can't recommend it highly enough, everything you need for the perfect holiday in a perfect location. ThAnk you and I am glad you enjoyed your stay! I highly recommend this condo. Close to the beach, all the amenities you could wish for. Two large bedrooms, and two bathrooms. Excellent finishings. Property management, housekeeping staff and the owner are all truly attentive. We have rented several apartments thru VRBO and this one stands out. We will return for sure. We stayed for a week and there is a lot more to see. Bought groceries at Jordan,s in Speightstown and Massy's in Hometown. Highly recommend taking staples with you as prices are high. Car rental was hard to get, so would recommend renting before you go. We were 2 couples who stayed at Harald's condo. The pictures show exactly what the condo is like and it's really lovely. We chose to take a taxi from the airport for about 80 Barbadian and it's about a 45 minute drive. You can ask Harald to have a few supplies on hand and reimburse the manager, Kathy later. Shopping is close by bus either north to Speightstown at Jordans or south to Holetown at Massys. Massys is a bit bigger and has Presidents Choice products. We took our own meat ....you're allowed 25 pounds...we declared it and had a declaration but didn't have to show it. We rented a car for 2 days and toured around the island. Rental cars are delivered and returned to the condo. Mullins Beach is really lovely and we had a meal at the restaurant which was very good. Rental chairs are 40 Barbadian for 2 on the beach with umbrella for the day.So all in all a wonderful and relaxing vacation. Harald is excellent to deal with, fair, prompt and we certainly hope to return for another stay soon. Oh and don't forget to pick up wine etc at the duty free at the airport just after you get your luggage. You're allowed 2 bottles each. The Dancing Flame red and white from Chile is excellent at $7.50 US. The Apartment 'Casablanca' is located at Mullins Bay - in a quiet cul-de-sac Palm Grove, Mullins, St Peter on the West Coast of the Island. There are only 4 Apartments which share the Pool and Garden. You walk only 300 m down the road to Mullins Beach!